Finding the perfect location to represent Janus, the remote Western Australian island portrayed in M.L.Stedman's The Light Between Oceans was always going to be a big ask. What was required was an iconic lighthouse, a period cottage and a windswept beach. 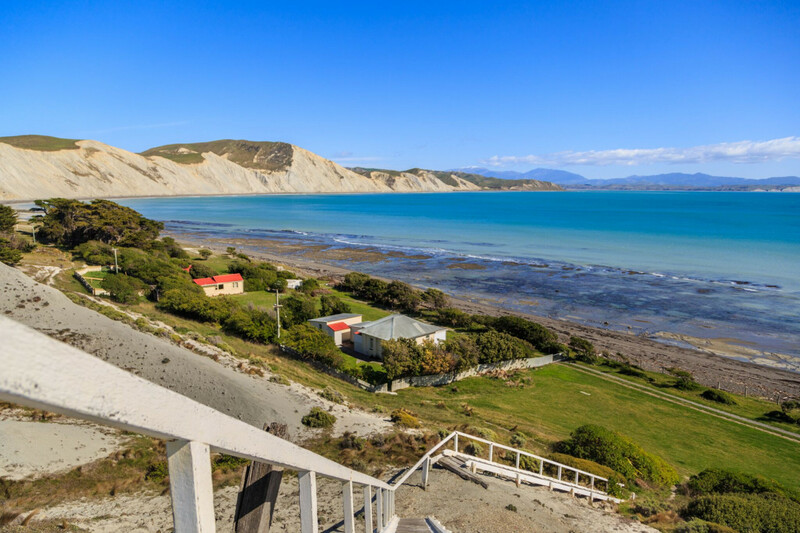 The location scouts hit the jackpot with Cape Campbell, a remote peninsula in the Marlborough region on New Zealand's South Island. The cottage and lighthouse are exactly as you see them in the film, but without the cameras rolling you can pull up at the door. The film crew set up here in October 2014, taking over the run of the coastal section of this private farm for 5 weeks of shooting. Yes, there is public access to the Cape Campbell beach and the lighthouse via a walking track from Marfells Beach, but beware that this route is tide dependent. The stunning coastline as seen from the steps of the lighthouse. The best way to travel to the fictional island of Janus is not by boat - you can drive to the door of Tom and Isabel's cottage and spend the night if you book a stay with Experience Cape Campbell. Pennie stayed two nights in the LBO cottage at Cape Campbell in June 2017. You can read all about my experience of this trip in my blog entry The Road to Janus. Needless to say the location certainly lived up to my expectations and in fact, exceeded them. It fulfils all the criteria that are important to us at FilmQuest: the locations are accessible, iconic and recognisable. The experience of staying in the butter-coloured cottage used in the film is worth the cost (as of the time of writing a reasonable $150 per night). Many of the film props are still on site including the bed, the wardrobe and much of the kitchen. And the chance to catch the sun rise and set over the wild coastline is out of this world amazing. I took some of the following scene framing shots with me, and found them all with ease. For any you can't find, just ask host Thomas Peter who was an on-site location manager during the course of the filming and has some great stories to share. Who could forget those intimate scenes on the porch? The porch end has been boarded up to protect visitors from the winds that rage through here. A peek inside the cottage - Isabel surveying her new home for the first time. The cottage is fully equipped with a kitchen, living room, modern bathroom and the bedroom is almost exactly as you saw it in the film. The bed is an original prop from the movie! From the cottage you can explore the surrounding coastline, take a day walk or just do some beachcombing. The cottage seen behind Isabel's shoulder is literally a stone's throw away from the beach. Tom and Lucy-Grace exploring the beach together. The jetty in the background was purpose-built for the film. It was removed after shooting was completed. Tom Sherbourne alone on the island of Janus. But of course the truly iconic feature of the film is the lighthouse. And this stunning tower on the hill doesn't disappoint. These romantic shots of Isabel running towards the lighthouse were more difficult to capture - you'll need to do some climbing here. Watch the rips in the ground from the November 2016 earthquake though! This shot was much easier - it's literally on the grass just before the steps to the lighthouse. The metal road was completely covered over and re-paved with a single walking track to give the shot its period authenticity. Tom Sherbourne battles the wind on the steps up to his lighthouse. Tom carries Isabel down the steep wooden steps at the foot of the lighthouse. The close up shot of Tom and Isabel - looks romantic, but those steps are steep. Hats off to Michael Fassbender. The location is truly a hidden gem in New Zealand, one that deserved the stunning cinematic treatment it got in The Light Between Oceans. My only regret? That I couldn't stay longer. For further questions, or to book a stay at the cottage, talk to Thomas Peter at Experience Cape Campbell. And if you're staying at the cottage you are literally miles away from the nearest shop, so make sure you take a good supply of food with you.